By the author of the Pawleys Island Paradise series … same beachy setting, same heartwarming read. Hardworking, successful lawyer Nora Ramsey, was at the height of her career. Now, she’s questioning everything in Murrell’s Inlet, South Carolina. When she accepts her aunt’s dilapidated estate as her inheritance, Nora is plagued with misgivings and doubt. When one of her newly inherited horses takes ill, she prays for guidance and receives it in the form of veterinarian Shaw Flynn. Dedicated and rugged, he assists Nora through the trying time. In Shaw, she sees someone gentle, caring and deeply devoted to God. The more she’s with him, the more he inspires her to embrace her own faith. 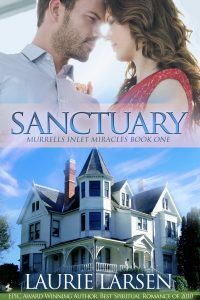 And as their relationship blossoms into a something real and beautiful””like the coastal sunsets of Murrell’s Inlet””Nora stumbles upon Shaw’s deepest secret. Her trust is destroyed and the wisdom of her life-changing decision shaken as the future she envisioned is threatened. As the truth becomes clear, can she find forgiveness within the sanctuary of her heart or will his betrayal destroy her faith in him once and for all? Christian fiction grounded in today’s modern world. It’ll make you laugh. It’ll make you cry. But most of all, it’ll make you feel good.